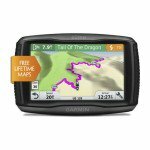 The Garmin Zumo 595LM is a premier model in the Zumo range of GPS units with a glove friendly, glare reducing transflective 5inch bright touchscreen. The screen can be viewed in landscape or portrait mode to help show clearly what’s ahead. The Adventurous Routing allows you the option of more interesting twisty, undulating roads on your journey. As well as getting audio prompts via Bluetooth, including spoken street names, you can also play music, access your mobile phone, link up with the optional Tyre Pressure Monitor Sensors (sold separately) and the Garmin VIRB action camera (sold separately). PhotoReal Junction View displays realistic views of junctions and interchanges on your route to help ease navigation through these areas. Off road, the Zumo 595LM supports TOPO and custom maps (sold separately). It can depict 3D terrain so you know exactly what to expect – it’s also rugged enough to handle the adventure. For a detailed list of the Zumo’s capabilities take a look under the features tab above. Featuring Garmin Adventurous Routing™ options for those twisty, hilly, terrain-hugging rides you love, zumo 595LM is the motorcycle navigator “built to thrill.” Its large, glove-friendly 5.0-inch high-res touchscreen can be viewed in landscape or portrait mode. And transflective technology gives it a bright, crisp color display that reduces glare and is easy to read in sunlight. Sync your zumo with a compatible smartphone² and a Bluetooth-enabled compatible headset or helmet (sold separately), and you can make and receive wireless calls without having to remove your gloves or helmet. Safely stow your phone in a pocket or saddlebag, and still have the benefit of hands-free calling without diverting your attention from the road. You can also receive customizable smart notifications³ for calls, texts, app alerts and more that appear right on your navigation display. What’s happening on the road ahead? 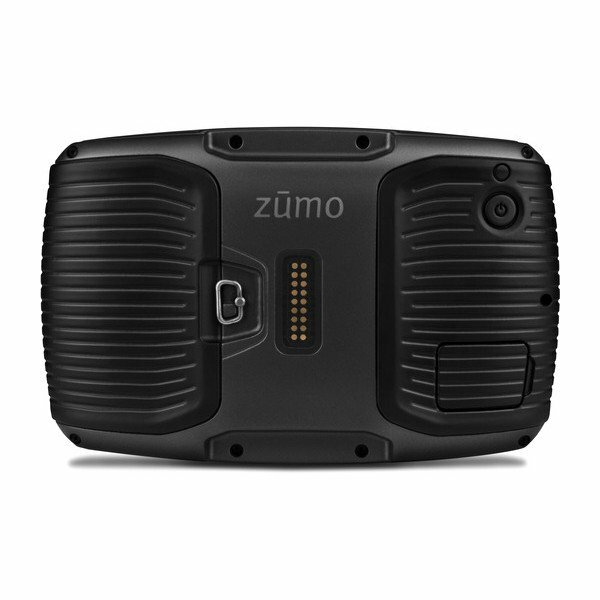 zumo 595LM can connect you to live weather radar and traffic information via the wireless Smartphone Link7 app. This app also enables LiveTrack, a nifty feature that lets friends track your whereabouts whenever you’re out on a ride. zumo 595LM includes free map updates5 for the useful life of your device, so routes reflect the most up-to-date points of interest and maps available. Real Junction View displays realistic views of junctions and interchanges on your route to ease navigation through complex interchanges. A brightly colored arrow on the zumo display, along with helpful voice prompts, will indicate the proper lane position needed for your next turn or exit. zumo 595 displays 3D Terrain and elevation information. There’s also a TracBack® feature on zumo that allows you to navigate the same route, in reverse, for your return trip. For added protection on the road, zumo 595LM is compatible with the Garmin Tire Pressure Monitor Sensor6 (TPMS, sold separately). One TPMS is required for each tire and will work with metal valve stems only. TPMS uses wireless technology to transmit the tire pressure data, letting you view it in real time right on your zumo display. Use Garmin Express™ to keep your zumo 595LM up to date. Garmin Express makes it easy to update maps and software, transfer favorites to and from devices and install free custom vehicles and voices. 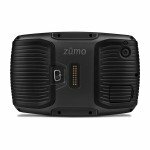 Plus, for added versatility, your zumo 595LM also comes with an automotive mount and power cable — in addition to its motorcycle mount — so you can use it on the vehicles you drive, as well as on the ones you ride.